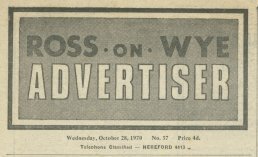 The Ross-on-Wye Advertiser had its first edition on the 26th November 1969 and continued until around the 1980's. It was printed in the tabloid format, which is the format favoured in April 2006 by the Ross Gazette. In 1970 the Ross-on-Wye Advertiser cost 4d and by 1978 it had passed through decimalisation and cost 7p. In 1970, it reported on various news from the Ross and the local area with plenty of local advertising, in competition to the Gazette, but by 1978 most of the news and adverts came from Hereford and Leominster with a greatly reduced focus on Ross. In 1970 it was published by the Hereford Times Ltd, Bath Street, Hereford and printed by Berrow's Newspapers at Hylton Road, Worcester but by 1978, it was still printed by Berrow's Newspapers at Hylton Road, Worcester but was published by them at 46 Broad Street, Ross-on-Wye.